A lonely place, it seems to me. Too soon the night, so far the dawn. Alone as I in lonely flight. Since my territory as a Cessna rep was almost all to the north and east of me, I witnessed literally hundreds of sunsets during my evening flights back to home base. During one especially beautiful and lasting transition from day to night, I wrote the above. Looking back, I suppose I was experiencing some wistfulness during this time, since in addition to being on the road all week I had no real home life either, for that had gone, along with everything else in the financial disaster I'd suffered. I think I was grieving some for my past life. Most weekends that weren't booked attending airshows to man the Cessna displays were spent traveling back to WV and visiting friends there. Entertaining dealers aside, I was leading a rather solitary existence during this period. Still, as a glass half full sort of person, dark reflections occupied only a small part of my time. I threw myself into my new work, and with a net worth hovering around zero, I got a kick out of the faux wealthy lifestyle I enjoyed through the week as Cessna's man in the field. Traveling in the spanking new twins, staying in the best hotels and eating the same fare as the rich folks somehow helped to make up for my much reduced financial state since losing my business. West Virginians have a well known penchant to travel only East and South for their vacations and elective travel. Myrtle Beach, SC is known as the 'Hillbilly Riviera' and summertime Ocean City, MD swarms with sun burned Mountaineers. Florida and Georgia are also popular destinations for Mountain State travelers. Call it a genetic inclination, but almost never do West Virginian's travel by choice to the Northeast and I was no exception. I had little exposure to the area before being assigned here by Cessna, given a new airplane, an expense account and being told to get to know my territory. It was all new to me and I found it to be a very pleasant duty to explore my new world. My first summer with Cessna the America's Cup Races were being held in Newport, RI and newspapers across the US were full of news about the event. Ernie Ayer, the other zone ME demo pilot and I decided, since we were free to stay anywhere in the zone that we liked, that should meet in Newport and spend the evening together, taking in the town and soaking up some of the excitement of this famous event. We agreed to assemble there on a Thursday at four in the afternoon. I remember I was flying a 421 that day and Ernie a 340 when we met at the airport. After climbing out of our airplanes and greeting each other we stood talking on the ramp in front of the twins. The engines were crackling as they cooled and the smell of hot, new paint wafted out of the cowlings while we caught up on the zone gossip. The line boy arrived and after greeting us and asking for our fuel orders, he ran his had lovingly over the nose of the Golden Eagle. He said wistfully to me that it must be wonderful to be financially able to have an airplane such as this. I smiled and told him that I guessed it would be, but personally I couldn't afford the air in the nose tire. The bars and restaurants of the town were overflowing with the crews of the racing ships and with the thousands of spectators here to see the races. The streets were jammed with celebrating folks whose looks and demeanor stated 'money' in no uncertain terms. 'Captain Outrageous', as the communication mogul Ted Turner was known by his seafaring brethren was in town too. He had a ship in the race and as we explored the town and the docks I was keeping an eye out for him and his crew, hoping to witness some of their notorious antics. We wandered down to the docks to check out some of the most beautiful sailing vessels I'd ever seen, and walked from ship to ship soaking up their majesty as they rocked gently at their moorings. 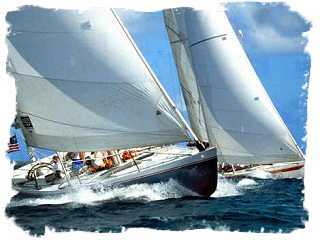 Lean and taught, these seagoing racers embodied every refinement and trick that had been learned in hundreds of years of sailing, in order to glean every scrap of speed out of the sleek hulls. I thought yet again how linked were the concepts of sailing and flying. We chose a fine restaurant for dinner overlooking the marina and as the sun set and we sipped our before dinner drinks, I reflected that having money was nice, but having other people's money came in a close second. The song 'Sailing' by Christopher Cross was popular at this time and it played almost constantly over the loudspeakers throughout the town. There was an air of expectant excitement everywhere which was totally contagious, even to two country boys who had no real business being there. The weather that day was perfect, the town was beautiful and the whole experience remains as fresh and detailed in my mind as if it happened only a few years ago, instead of the thirty something that it actually did. On another occasion one late September evening I was making my way VFR up the coast to Portland, where I had a meeting the next day. 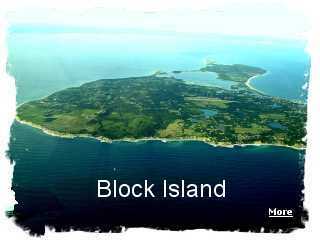 On my right, standing several miles out to sea I noticed a large island and a check of my chart proved it to be Block Island, which had an airport. On a whim I decided to spend the night there and turned the 310 seaward for the 13 mile trip over the water. I landed and inquired about lodging for the night and was told that most of the hotels had shut down after Labor Day, but that there was one still open. I called, got a room and shortly after was driving the courtesy car to the hotel. In conversation with the clerk at the front desk, I soon found that in my ignorance I had stumbled upon a jewel. This was one of the more pristine and beautiful spots in existence and one that The Nature Conservancy had added to their very small list of "Last Great Places". The island covers less than 10 square miles of land with a year round population of about a thousand which swells to many times that in the summer. It is known for bicycling, hiking, sailing and fishing and for its two historic lighthouses, and I had never heard of it before this evening. By sheer happenstance I was here and had lucked into having the whole island to myself, because only workmen doing maintenance on the hotel were here besides me. I remember having a great run along the beach that evening and a delightful meal back at the hotel while thinking how neat it is that such wonderful things can happen unexpectedly, since yesterday I had no idea this place existed. 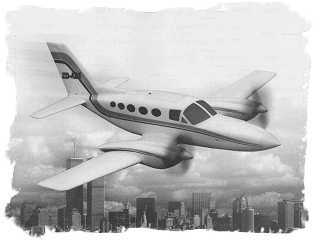 I had many duties as Cessna's pilot specialist on the twin engine aircraft they were producing, and interaction with the end customer, the proud owners of our twins, was one of them. Whenever a maintenance problem surfaced that involved flying the airplane with the owners, I was called in by the dealer's shop. I once heard that the definition of an expert in any given field involved a suit, a briefcase and a man from out of town, which pretty well described my status as I showed up to help the mechanics diagnoses problems with the airplanes and pacify the owner. On one such occasion, a customer had complained that when he was in cruise flight at 25,000 feet or above in his new 421, the engines would 'bootstrap', a condition where the manifold pressure would vary while the controllers vainly tried to regulate the pressure the turbochargers were sending to the engines. The shop called and asked me to fly with the gentleman and take the airplane to altitude and see how it behaved. After meeting the owner and listening to him describe the malfunction, I strapped into the pilot's seat with the owner beside me and we taxied out and took off. With less than 50 hours on it, the airplane still smelled brand new and I watched the gages carefully for any abnormal indications, but everything appeared as it should. As we passed through 10,000 feet on our way to 25K I did notice that the airplane was climbing much slower that it should be, and the higher we went the slower it climbed. As we reached the high teens with the rate of climb having decayed to less than 500 feet per minute, I was thinking that if I was this owner I would be complaining about the lack of performance rather than the bootstrapping. Finally, after what seemed an age we arrived at 25,000 feet and I started to configure the airplane for cruise flight. As I looked down to adjust the throttles something caught my eye that should not be there. There by my right knee, three little green lights that should have been dark were glowing happily. 'You idiot', I thought. I had no idea how it had happened, but I had missed retracting the gear! Rats! No wonder we had struggled to get to altitude. I glanced quickly at the owner, but his attention was riveted on the manifold pressure gages and amazingly he hadn't noticed our dangling gear. My mind raced, wondering how I was going to get the gear up without him knowing I'd left it down, thereby blowing my guise as an all knowing, all seeing guru on his expensive airplane. I turned to the owner and spoke, engaging his eyes. I said that I wanted to start out flying at a slower speed to check for bootstrapping before running the check at cruise speed and I will now therefore extend the gear. Before his eyes could leave mine and travel to the gear switch, I had moved the switch from extended to retract momentarily, then back to extend. By the time his eyes moved to the gear switch area the gear down lights were out and he then saw them come on as the gear thumped back down. I can't recall what was resolved in regard to the bootstrapping, but I do remember being very thankful that I hadn't blown my cover and that the owner hadn't investigated why his new airplane was climbing so slowly that day. Then there was the prospective owner we'll call 'Joe'. Joe was the successful owner of a large air conditioning company and he had just sold his Baron and was looking to replace it with a 340. I was called in to do a demo flight with him for Miller Aviation and I flew a demonstrator in to meet him at his home Pennsylvania airport, along with Nick, one of the partners at Miller. Joe turned out to be in his high sixties, a self made man who had emigrated from Italy, overcome many disadvantages and had made his fortune through hard work and business acumen. I was told he had a pilot working for him and that he himself had a Private license and Multiengine rating, but no Instrument rating. On this day he and not his pilot would be flying the 340. The weather at the uncontrolled airport was IFR and we had arrived via the VOR approach. I had filed a flight plan for the demo flight and as Joe taxied out I picked up our clearance. He wanted to go to altitude to experience the pressurization, so I had filed round robin to a distant VOR and up flight level 240. After flying with hundreds of pilots ranging in ability from professional to beyond scary, a demonstration pilot gains a sixth sense regarding the people he's about demo. He develops countless little sensors that almost subconsciously receive dozens of inputs from the person he's about to fly with, and these enable him to judge pretty accurately what kind of a ride he's about to have before ever taking to the air. The way your prospect approaches the airplane and even how he touches it; how he starts the engine and taxies the airplane are just a few of the myriad things that tell the story of the pilot you have drawn this day. My sensors did their job with Joe's inputs and relayed to me that I needed to be very alert indeed today. I briefed Joe and told him what to expect from the 340 and stated that he needed to watch the runway and I would call out when it was time for him to rotate the airplane for takeoff. He lined up on the center line of the 3500 foot runway and asked if I were ready. I replied that I was, and before I could move he had slammed the throttles to the stop. The engines responded with uncoordinated surges as the shocked controllers vainly tried to regulate the boost from the goosed turbocharger's uneven spin up. My feet danced on the rudders to help our erstwhile pilot keep the airplane on the runway. Approaching 90 knots I told Joe to rotate and he responded by giving us the mother of all rotations. He kept on rotating as the airplane left the ground and was still rotating when we shot into the overcast at what must have been a 45 degree angle. I had been pushing forward on my control wheel ever harder, and when that had been insufficient to overcome Joe's enthusiasm for the rotation I began to verbally exhort him to lower the nose. After a few ever louder repetitions, Joe suddenly decided he would throw himself into de-rotation just as joyfully as he had into rotation. Charts and approach plates glued themselves to the roof and my Cross pen floated up out of my pocket and disappeared as Joe added his forward pressure on the control wheel to mine. Nick, back in the cabin told me later that he was on the ceiling, along with his briefcase. Suddenly we were out of the bottom of the overcast at an angle that looked very much as if the airplane had a date with the numbers on the opposite end of the runway. Assuring Joe that it was time for him to take a break from flying, I got the airplane under control and then proceeded to let Joe see how well the autopilot flew the airplane until we broke out on top. Joe bought a 340, fired his pilot and proceeded to fly it for several years without an accident, so far as I ever knew. He never got an instrument rating and confided to me one day when he came to the Miller shop for some maintenance, that the clouds were very high at his airport that day. He said he had to go all the way to 18,000 feet to get on top. The autopilot had worked just fine, he added.